Tahmima Anam’s Bengal trilogy finds a resting place. Zubaida Haque, narrator of The Bones of Grace, envies the moral clarity of her adoptive parents’ generation. They grew up in Bangladesh when it was still East Pakistan, serving in the national liberation army during the 1971 War of Independence. People knew what was right and what was wrong then, Zubaida imagines; Bengali nationalism had forever animated their lives with a purpose that hers lacks. Four decades later, the family has grown wealthy through her father’s textile business. Zubaida’s upper-class, postmodern youth feels maddeningly easy next to theirs, so easy that she’s crushed by the weight of everything she must choose, all the possibilities of her academic life in America and her duties at home. Near the end of the novel, when she comes upon a roomful of laborers mutilated by Chittagong’s shipbreaking industry who’ve been deprived by their boss of medical care, she is finally moved by her mother’s imperative: “The sight of those workers changed what I knew about the world and my place in it. It made everything else shrink.” The modern world is still filled with moral catastrophes. 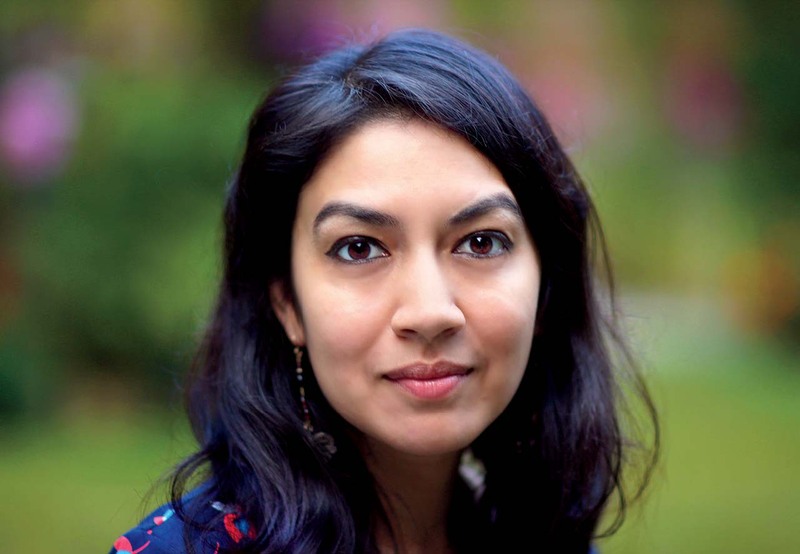 Bones concludes the Bengal trilogy that Tahmima Anam, Ph.D. ’05, began more than a decade ago, each novel a self-contained portrait of a generation of the Haque family. A Golden Age follows Zubaida’s grandmother, a widow during the war. In the sequel, The Good Muslim, Zubaida’s mother, a doctor who works with women raped during the war, makes sense of a reconstituted Bangladesh, suddenly more religious and autocratic, eager to forget the past and embrace ties with Pakistan. Bones, the longest and most ambitious of the trilogy, expands the orbit of Anam’s story beyond Bengal to Pakistan, Dubai, and Cambridge, where its protagonist is studying paleontology at Harvard. Zubaida, much more than her mother and grandmother, must “cobble together an identity,” as Anam puts it in an interview, because no great historical moment has anchored her generation. The narrative is pushed forward by Zubaida’s romance with Elijah, a philosopher whom she improbably meets at a piano concert in Sanders Theatre. But she has a long-term boyfriend in Bangladesh, whose marriage proposal she feels pressured to accept. This is not, as some reviews have suggested, an arranged marriage; her parents are too modern for that. The relationship is more subtly fraught, colored by Zubaida’s longing for security, her worry about estranging their two families, and her fear, which she recognizes only after meeting Elijah, that she can repay the debt of her adoption only by doing what her parents expect. Bones reaches its central question when Zubaida realizes that she isn’t okay with not knowing who her birth parents were, that she must know. That need takes her through a deeper understanding of herself and her country, each tangled subplot revealing a world still captive to the past even though old boundaries have collapsed: a colleague on a dig in Pakistan is suddenly arrested and dragged away, caught in a tribal conflict; a little boy and girl are maimed at a shipbreaking site, where giant decommissioned ships (and often human bodies) are stripped to their skeletons. The recurring metaphor of bones extends to Zubaida’s hunt for the fossils of an extinct walking whale, and to her almost metaphysical belief in the importance of flesh-and-blood relationships—an obsession that eventually begins to unravel. “When I studied the fossils of Ambulocetus and Pakicetus, I told myself the souls of those ancient creatures were in their bones,” she reflects. “But now, confronted by these fragments of people, a room in which the atmosphere had been thinned by the fleeing of hope, my knowledge of bones gave me nothing, no explanation, no prescription.” The plot’s epic scale would be unconvincing, were it not for Anam’s humanizing prose. Bones is filled with ordinary people crushed by the machinery of modernity, recalling Anam’s training as an anthropologist. “Of all the social-science disciplines,” she says, “anthropology is the most open to questioning what the truth is and looking at the truth subjectively, understanding [that] the truth is contextual.” Yet while interviewing freedom fighters for her dissertation on historical memory in postwar Bangladesh, she felt confined by the requirement to tell the truth. Within the constraints of academic research, “I wasn’t fully able to explore the truths that we can only discover by making things up.” So after her dissertation, she enrolled in a creative-writing program in London and gave herself a year after finishing her first novel to find a publisher, or else look for an academic job. A Golden Age was published in 2007. Anam’s need to “make things up” does not mean she’s uninterested in factual accounts of Bengali history—her stories are about the relationship of facts to national identity. She assiduously researched the details of the War of Independence: its massacres, war crimes, and underground operations. Bones, the novel set furthest from the war, asks what those facts should mean now. One of its smartest moments takes place outside of the courthouse where real-life Bengali politician Ghulam Azam has just been convicted of war crimes. A massive crowd, dotted with people Zubaida knows, screams “Death!” and “Hang him!” Azam, now 90, emerges looking tiny and shriveled in a wheelchair, his hands cuffed in front of his body. He will die in prison a year later. What is the value in the conviction of an almost dead man, or the tribunal’s fact-finding exercise? For Zubaida’s mother, who provided testimony in the case and spent her life obsessed with the war, the moment is the proudest of her career, a way to neatly avenge her country’s humiliating past. But this is not Zubaida’s battle. She gapes at the incident, struggling to feel something, and returns to her search for the facts of her own life.